Please note: No 24-hour front desk. Opening time is: from 7 am to 9 pm. Welcome to Casa Felipe San Pedro la Laguna after a renovation! It´s a fresh beginning! We´ve just finished renovation in Casa Felipe to improve each aspect of your stay. From now on you can be sure that spending time here will be a pure pleasure. We take perfect care not only of our guest but also the environment (you can read more about it below). Here you can take a deep breath relaxing in our spacious garden full of fruit trees, herbs and exotic plants. Although the space has been renovated, we still remain an ecologically friendly hostel. Now a days the building remains with certain modifications. We maintain these ecological tendencies by keeping the same hygiene practices and its septic system to filtrate the water. Those efforts have the purpose of keeping LAKE ATITLAN CLEAN. Now Casa Felipe is able to receive up to 35 guests at the time. There is boat rides arriving from Panajachel every 20 minutes and plenty of buses arriving from the capital city or Xela. Antigua Guatemala also offers different shuttle companies coming this way on a daily basis. We offer 5 private rooms and 3 dorms to get rest after your journey. In the large fully equipped kitchen you find everything you need to feel like home and prepare your own meals. Each day we offer free coffee for our guests and a possibility to try a delicious homemade hot supper. Once you taste it you love it! In the evening there is a time to socialize with other guest playing billiard or sipping colorful drinks served straight from the Guatemalan designed bamboo bar. Casa Felipe San Pedro la Laguna is located in a calm area with fast access to the lake, boats and restaurants. In 5 minutes you can hit the most party area with bustling places with live music almost each evening. Another 5 minutes and you find the colorful local market with tasty fruit, fresh vegetables and local vibe. You will never get bored here. No doubt! Hiking the San Pedro volcano, watching the sunrise on the top of Indian Nose, horse riding to explore coffee plantation or kayaking to enjoy the beauty of Lake Atitlan - these are only few examples of spending unforgettable time in San Pedro La Laguna. 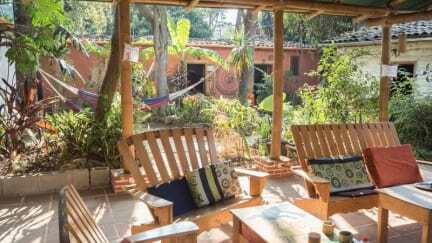 The dormitories and the private rooms are made of adobe (type of dirt mixed with other organic materials) which is thermic, free of toxic cement elements. Besides our friendzone living room is made of bamboo which is a renewable material that in 4-6 years grows back to its normal adult plan size. Our mattresses and pillows are 100% biodegradable since they are made of rustic cotton. They keep the body temperature and at the end of their usage cycle in about 6 month they turn into earth material. Our Green cleaning products are 100% homemade. Their base are baking soda, peroxide, sometimes alcohol, eucalyptus, clove, lemon plant etc. The soap that we use is phosphorus free. The biodigestor is designed to clean the sewage water. Our absorption well is made of pure clay which makes filtering highly effective and the water from there after traveling 200 m to the lake Atitlan does not contaminate it. This information and construction is validated by the Department of Environment and Natural Resources of Guatemala. The biofilters are made of pebbles, sand, some earthy materials and is enhanced with some semi-aquatic and aquatic plants that eliminate phosphorus, nitrogen and other harmful elements from the water. Those chemicals are the main cause of cyanobacteria that usually contaminates the lake. There are two biofilters, one is for sewage water, which is used as penultimate filtration after the expulsion of the biodigester. The second one is the future project for gray water, which will be creating a deposit of clean water that will serve for irrigation of inedible plants and sanitary water. The air quality is different in the hostel thanks to the special air purifying plants and trees in our large inner garden. It also provides herbs for cooking and medicinal purposes. Really chill place only a short walk from all the bars and activities. Good kitchen, toilets and warm shower. Other people at the hostel also easy to hang out with during my stay. Good choice to stay and go out to bar or activities and come back to sleep. Owner speaks mainly just spanish but is a super nice guy! The hostel is set in a really good position in San Pedro. Lots of outdoor space to relax in. The dorms were a little cramped when fully occupied and the beds were seriously firm. I think they need to invest in some good mattresses (not just bits of foam) and pillows. The shower was ok. The staff were also ok, though sometimes hard to find. I stayed there for one night. It was definitely basic, but the price was low so I was fine with the hostel. The beds were surprisingly hard and uncomfortable, however. The guy who worked there came out and checked when we entered after partying late one friday night, which I appreciated that he checked if people are bringing others in, but that guy made both me and my friend (who is also female) uncomfortable. He was always gaping at us as we walked around the hostel, in the middle of the night. Great place for a shoestring backpacker's budget. The staff is sweet, owner seems jovial but treats his employees with a lack of respect. The staff are friendly and helpful, it has good common areas and the facilities are okay. The location is a bit far from the main area but that was no problem for me. The kitchen is basic, don’t expect anything. This place is definitely rustic but is good for the area. Lockers did not stay properly locked. The owner is very strict. Not much of an atmosphere as it is small. Beds are insanely hard. Nice to have a kitchen to cook in.